Iron-rich water leads to the formation of iron bacteria, which convert soluble iron to insoluble iron precipitates. The result is a red, yellow, or tan slime in the drip lines and emitters. The source of the iron bacteria is not always clear, but it may be the result of contamination during well construction. Iron concentrations of 0.2 ppm are sufficient to support bacterial growth (see table 1). 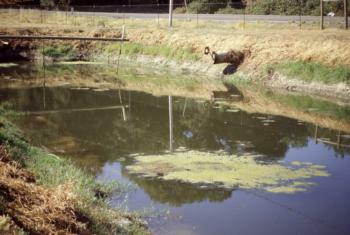 Hydrogen sulfide in the irrigation water results in sulfur bacteria, a whitish slime with a rotten-egg odor.